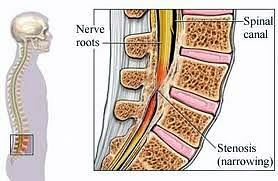 By definition, Spinal Stenosis is a narrowing of the spinal canal, nerve root canal or intervertebral foramina of the spine compressing and blocking nerve roots. Wow, what does all that mean? Everyone has a different spinal cord and canal size, therefore, the risk factor of developing it varies. Stenosis can exist for years and may go undetected. During this time, one may not experience any pain or discomfort associated with the condition. Often, it is usually gradual and gets worse as the spine ages and with various spinal movements, or when a sudden fall or accident takes place that stenotic pain makes itself known. Generally, click here for overall "Spinal Stenosis" information. Specifically, regarding cervical (neck) stenosis information... click here for video, "Cervical Spinal Stenosis". However, the most common area of spinal stenosis includes the L4/5 region of the lumbosacral spine (low back)... click here for video, "Lumbar Spinal Stenosis'. To explain, the brain sends information down to the body by way of the spinal cord. This structure is about the size of your little finger and extends all the way down your spine to a little above your waist. Actually it ends at the bottom of the thoracic spine and rib cage; the rest of the spinal column contains individual nerves. If the opening that the spinal cord travels through gets smaller, that is called stenosis. If the opening that the nerves pass through in the neck or low back area gets smaller, or if the opening that the nerves exit the spinal canal from gets narrower, that is also called stenosis. Imagine wrapping elastic around your finger. The tighter the elastic is, the more irritated your finger will be. The circulation gets cut off and your finger may swell, turn red and become painful. 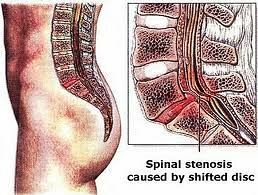 The same thing happens with stenosis. As the opening the nerves or cord pass through gets smaller, the little blood vessels associated with the nerve structures will get irritated and symptoms will occur. It may be asymptomatic for years without causing pain or discomfort, but any type of trauma, including a fall, may trigger characteristic stenosis pain. The diagnosis of spinal stenosis is based upon the patient's history of symptoms, an imaging test, and a thorough physical examination. Unlike an MRI, an electrodiagnostic study is usually viewed as a more reliable method of gathering information on stenosis. To diagnose spinal stenosis arising from an infection or an abscess, a blood test may be required. On the other hand, spinal and vertebral tumours are best diagnosed with precise imaging. At times, it is tough to differentiate between neurogenic claudication and vascular claudication. This is when the blood supply to the legs is not adequate and is not sufficient to support the muscles and tissues of the leg. For those who have neurogenic claudication, walking uphill is a better option because it results in bending of the spine in the forward direction when walking. Walking downhill becomes problematic as the spine arches and pushes the spinal cord closer to the vertebrae and causes increased symptoms. Often, it is the source of spinal stenosis that determines its treatment approach. For starters, medication can be effective in providing temporary pain relief; however, it can also worsen the patient's sense of balance. Surgery may be recommended in cases where the patient has issues with bladder and/or bowel control, experiences acute leg pain, undergoes progressive loss of function, or has a spinal cord tumour. These patients often report improvement right after the surgery. Even so, many surgeries have to be repeated since symptoms are likely to return after a period of time. Surgery can also change the structure of the back, occasionally creating other problems. Over the long term, studies show that outcomes are similar between surgery and conservative care. Since spinal stenosis is viewed as a chronic condition, it cannot be cured - but it can be managed. Improvement can be marked and sustained on a long-term basis. A holistic view of the condition allows for seeking ways to improve the patient's overall quality of life while reducing symptoms. A doctor of chiropractic focuses on this holistic approach. Conservative care is appropriate for people with mild to moderate symptoms, while surgery is reserved for patients with severe symptoms. You and your health practitioner would need to work together to decide which course of treatment is best for you. I will tell you that while I am an advocate for conservative care, I have observed spinal stenosis surgery and for the most part, it is as mild a surgery as any surgery could be. But because there are always risks associated with surgery, unless there is a condition called Cauda Equina Syndrome (bowl or bladder incontinence), trying conservative treatment is always the first way to go. Non-invasive chiropractic care that incorporates spinal manipulation, physiotherapy modalities that include low-level laser therapy (LLLT), specific stretching and strengthening exercises, life-style modification and techniques of administering self-care. These methods help to reduce pain and discomfort, while improving joint mobility. This is helpful with mild and moderate cases of stenosis. 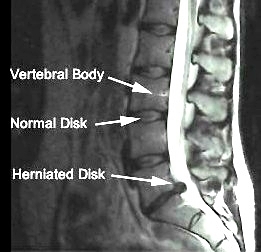 For more acute cases, computerized spinal decompression (spinal distraction), in particular, may help reduce discomfort in the legs. Traction employs a pulling force to help widen the space between the vertebrae and lower the pressure on affected spinal discs, nerves and the spinal canal. Very often, this treatment method provides temporary relief. Exercise recommendations such as stretching and strengthening exercises of the lower back and stomach are especially helpful. These can include riding a bicycle, and performing exercises that require flexing of the spine. The patient should seek to perform these exercises on a regular basis. Patient education and awareness to have patience as 'It Takes Time to Heal" most conditons. Click here for further information. While alternative treatment will not eliminate the arthritic degeneration or other cause of the narrowing, the goal of chiropractic care is to decrease the symptoms, improve spinal mechanics and the quality of life of the patient. When you begin chiropractic treatment, your care may combine more than one type of approach to best suit your individual needs. At Advanced Healthcare, we work on weight loss, exercise, computerized foot orthotic arch supports, physiotherapeutic modalities, low-level laser therapy and chiropractic manipulative adjustments to reduce any other irritation that might add to the problem. There are no guarantees that conservative care will work for you, but it is always less risky to take that approach before undergoing more invasive procedures. Ultimately, stenosis is a long lasting spinal disorder that cannot be completely eliminated, but it usually can be controlled and improved with the appropriate therapy plan, and improvement can be sustained over the long term. Patients will work with Dr. Pisarek, who will implement a specific functional spinal stenosis treatment and relief plan based on their individual needs to control and manage symptoms of spinal stenosis. This will most certainly lead to an improvement in the quality of life and spinal stenosis relief for the patient. 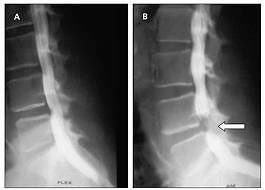 In the past, people thought that the ultimate resort in case of spinal stenosis is surgery. This is not the case anymore. With more people getting to know about chiropractic treatment, surgery is not the only option remaining. Chiropractic is a very safe and natural option in case of spinal stenosis. Chiropractors work by focusing on the mechanics and misalignment with associated nerve pressure (subluxation) of the spine. This is when a vertebrae does not function as good as it should be. 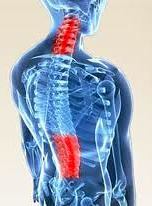 The result of this is that the bone and the tissue around it apply pressure on the spinal cord and the nerves. Chiropractic manipulative adjustment helps in balancing the soft tissues about the spine such as the muscles, ligaments and nervous system, and getting the joints moving properly again. It also may lead to a reduction in the symptoms experienced during spinal stenosis. Using flexion based exercise and other techniques along with chiropractic treatment can help in faster recovery. Chiropractors employ a conservative care approach devoid of surgery or drugs. When a chiropractor deems a condition to be outside of his or her scope of treatment, the patient is referred to another specialist. Dr. Pisarek may also seek your permission to contact your family physician to ensure coordinated care. The ultimate chiropractic goal is to increase the patient's overall quality of life and not just the symptoms. to get started on your "road to recovery".